Walk Like MADD is MADD's signature fundraising event to help us raise both awareness and funds to eliminate drunk and drugged driving. 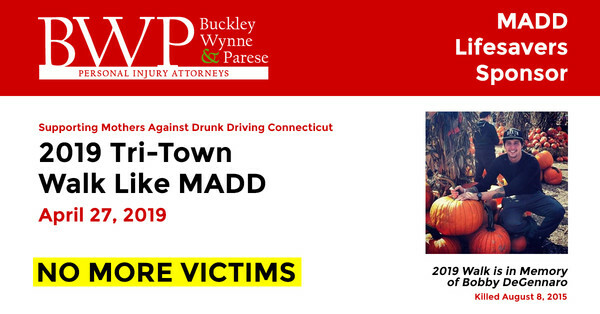 Buckley Wynne & Parese are happy to be a MADD Lifesavers Sponsor for the Tri-Town Walk Like MADD on April 27, 2019. Walk Like MADD is a community event to remember those killed, injured or emotionally devastated by drunk driving; to inspire those who may feel helpless or lost, and to commit to a future of No More Victims. We hope that you and thousands of others will rally together in over 90 cities around the nation to help create a future of No More Victims®. Sign up TODAY and help us save more lives!